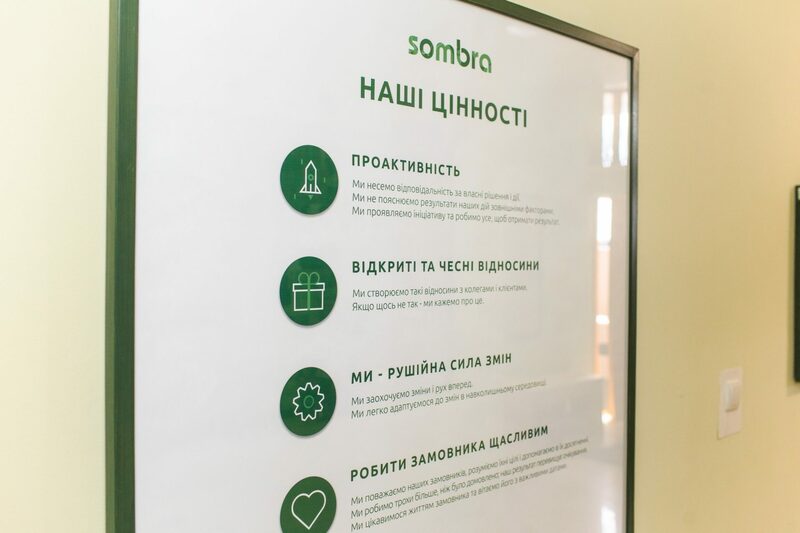 We talked with Viktor Chekh, Co-Founder and CEO at Sombra, about the history of the company, the importance of creating a special culture in small organizations as well as the main challenges for young entrepreneurs. Розмову українською мовою читайте за цим посиланням — Віктор Чех, Sombra. 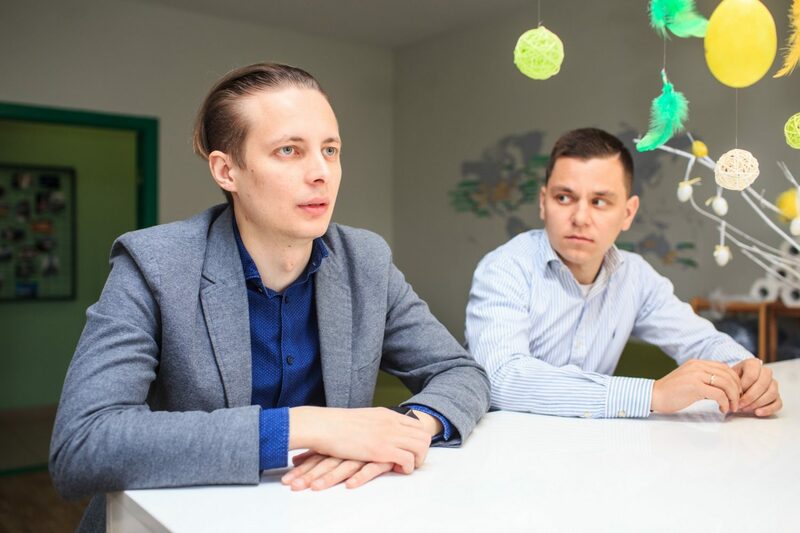 Viktor, could, you please tell us how your entrepreneur story began? My story is rather simple. I grew up in Ivano-Frankivsk region and came to Lviv to study at the Polytechnic. Later, before graduating from the university I started to think, what should I do next. In the beginning, I was honestly doubting whether to do programming or no. But since I had already devoted 5 years to studying it, I decided to try. …At first, I worked at ELEKS, then — for two years at SoftServe. While studying, I was always doing part-time jobs, so I had enough money. I traveled, participated in Work & Travel and believed that traveling during my student years will give me something bigger than work. Now I understand that it’s true. All of that gave me a much bigger experience that I could get if I devoted myself to work. After working as a developer for three years, I understood that it’s not something I’d like to continue doing. I wasn’t happy and understood that programming is not my vocation. I didn’t want to code for the next five, ten, or twenty years. There was no drive, and I wanted to do something that would be really interesting for me. This is when I got the idea to start my own IT company. I got interested in business while still being at university. I saw the models that IT companies use and they didn’t seem too complicated for me. This is when I decided I want to have a company myself. This is how it all started. I’ve immediately realized that I don’t want to do business alone. You can’t be strong in everything, thus, I needed partners. My task was to find them. Now there are three of co-owners. Who are the founders of Sombra? 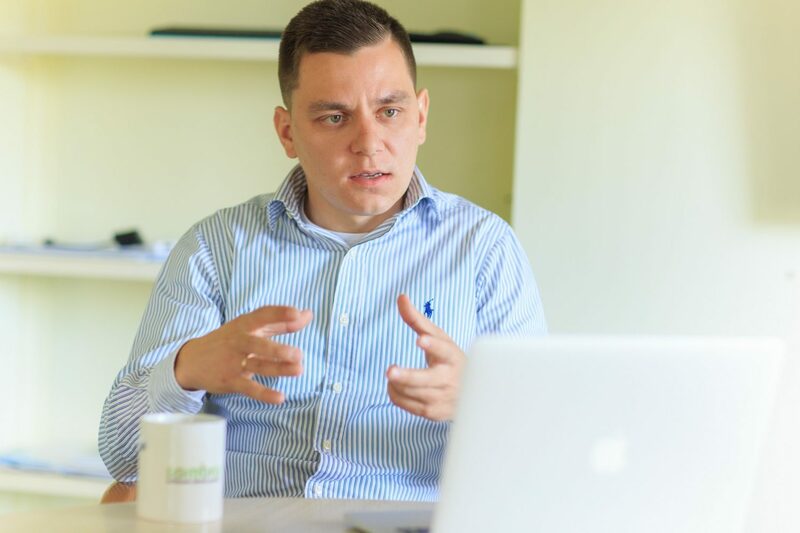 One of the partners is Serhiy Miakshynov, who is now the Head of Sales. He found me. This was back at the times when I was telling about my plans and dreams to start a company while drinking out with friends. Once Serhiy approached me and said that he’d like to cooperate. At that moment I really needed such proactive people. 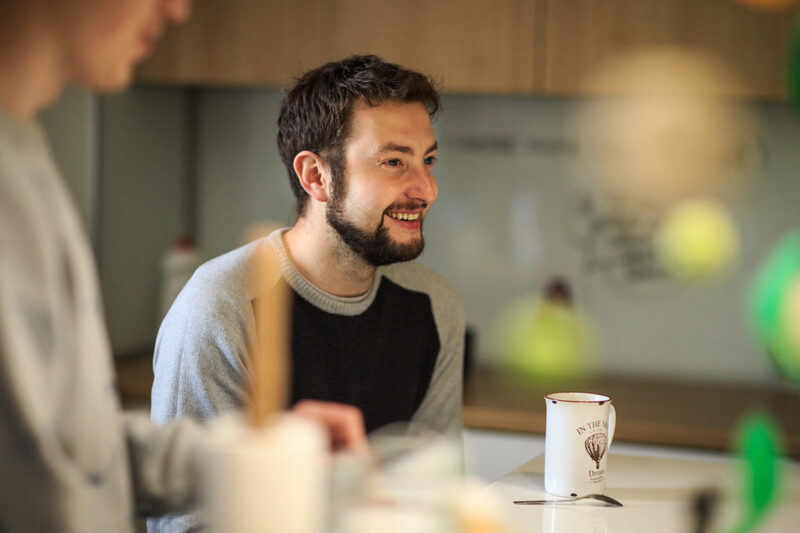 At the stage when Serhiy joined, we only had one freelancing project for one developer. This means that we had one hired employee, one project, and one rented room. We started thinking how to move forward. We clearly understood that we don’t have enough technical background, technical part wasn’t something we were strong at. Even though I was a developer, I didn’t want to do this for a living. I wanted to be engaged more in the business component. Therefore, we needed to find a person who would become our CTO. 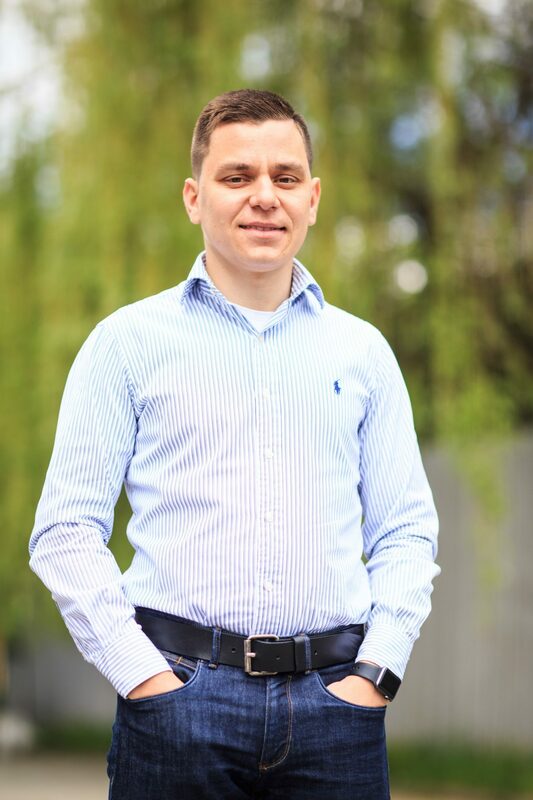 Together with Serhiy we have started actively looking for a partner. It was in 2014 and it took us almost 12 months. We were developing and slowly growing. Without a technical partner, we managed to grow to 10 people, but we understood that it is going to me much more difficult later. 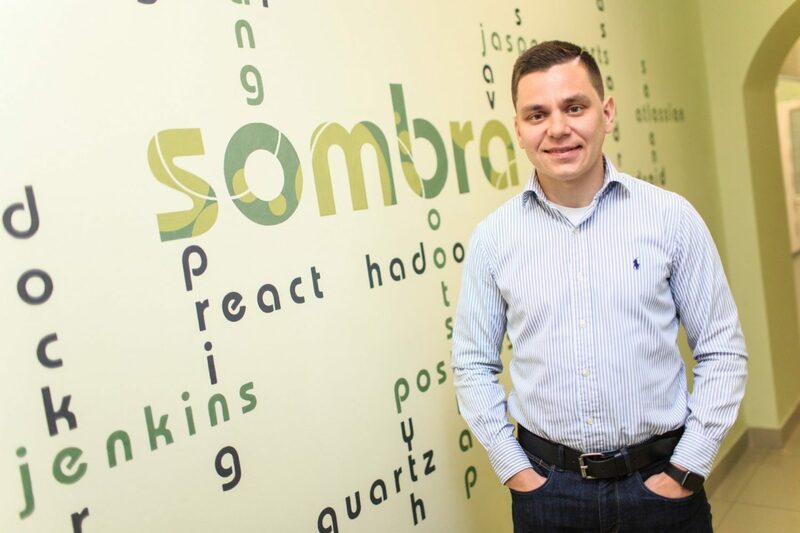 In the end of 2014, we were joined by our third partner — Yuriy Nakonechnyi, who is now our CTO. What is the company like at the moment? How many people work at Sombra? 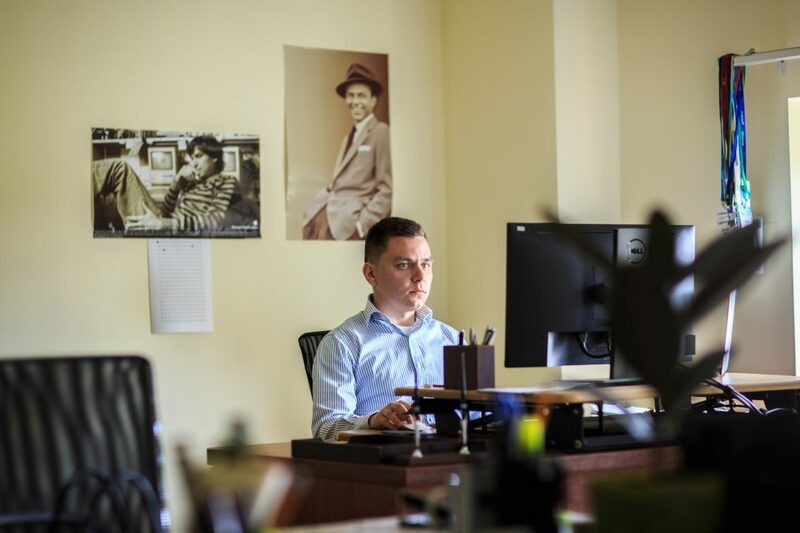 Right now, we have 70 employees and two offices — in Lviv and Ivano-Frankivsk. I spent the bigger part of my life living in Ivano-Frankivsk region, so it was interesting to have an office there too. 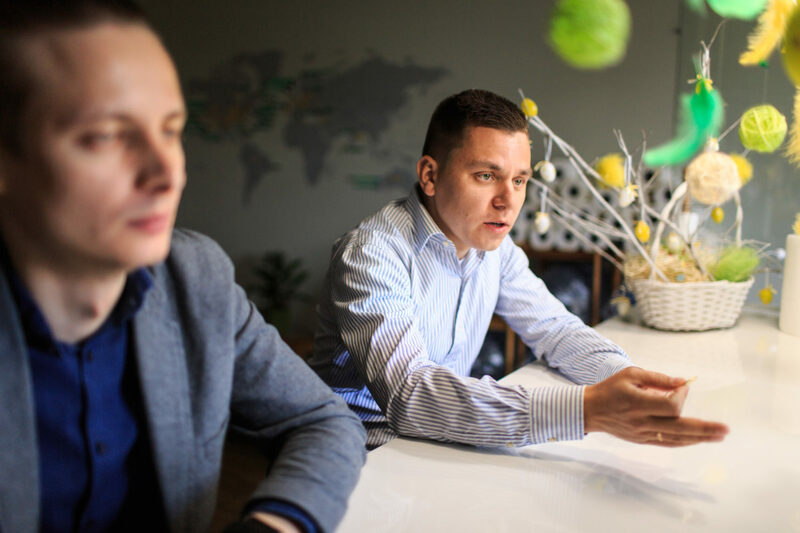 Currently, there are 13 developers working at Ivano-Frankivsk office and we encourage our employees to change a city and exchange “culture” from time to time. What exactly do you mean by “culture”? After being on the market for a year, we understood that we want to somehow distinguish our culture, define it to be able to recruit people who have similar interests and vision as we do. We hired first ten employees intuitively, and only later started to think about the culture. We understood that it’s easy for us to work and communicate with people that we have already hired because we are quite similar. However, there might be problems once the company starts to expand. We realized that we have to grow, so we started to think how to pass our culture on. …Some executives at some point realize that they don’t have any defined corporate values and decide to write them down. They make up these values and tell the employees that the values are as follows. However, such approaches never work since these are the values of the owners, not the employees. Employees might even perceive them in a hostile way. At that moment we have realized we need to do something different. We started organizing regular meetings with our employees. We would sit down together and discuss values, things that are the most decisive for us. This way, we have singled out the five core values. Of course, they have slightly changed with time, but they became the basis for our organization. On these values, we were building our culture. First of all — it’s proactiveness. We don’t hire passive people. We understand that big companies can hire a certain percentage of passive people, because they would get used to a bigger structure anyways. Smaller companies can’t afford to do that. Everything changes really quickly here and we have to be 100% confident in our employees. Secondly, we value our clients. We are an outsourcing company, and a lot of things for us depend on our clients. I don’t say that everything depends on them (because there are indeed many other factors), but clients are important and we’re trying to show this to our employees straight away. Clients pay money, so obviously, our goal is to make them fully satisfied with our work and even suggest us to someone later. Not all projects are super interesting, as well as not all technologies. However, work needs to be done. We discuss all of this already during the interviews, to avoid situations when someone says their project is not interesting enough. The third thing is self-development. We encourage our employees to develop both professionally and personally. People who are not developing constantly won’t work with us. The organization is growing, thus, everyone has to be growing too. We try to set goals for the next half a year with every employee and monitor their implementation. Staying at the same level is not very good. Therefore, we have a principle — either a person moves up the career ladder, or leaves the company. The fourth thing is changes. This means that everything changes. We have employees that joined us when there were only 10 people working at the company. They see that a lot has changed in our processes. Right now we are experiencing a period when the processes we used before become outdated and we need to rebuild our organization. We try to make people understand from their first interview — you need to be flexible and adapt to changes easily because everything changes really quickly. It may seem that these are trivial things at first, but from time to time we change the rooms of our employees, for them not to get used to the same people around. Experienced employees sit next to the younger ones — so they could pass on the culture. Relationships are our fifth value. We try to be as open and honest as possible with our employees and maintain close relations between them and management. We don’t have any separate offices, we work together. Every week we have morning meetings – short stand-ups where everyone tells what they have been working on recently. We managed to keep this tradition from the very beginning. We always emphasize that if something goes wrong, you have to be frank and honest about it. What is the big idea of your company? Our mission and vision — are much deeper matters than values. You have to think why are you going to work every day. In my opinion, these questions depend more on the owners of a company. While values are in its employees. The vision means how we, as the owners, see our company in the future. We show the direction and ask our interviewees if our interests coincide. We decided not to use many fancy words, and have just put down what do we want in the future. We want to build a big outsourcing services company that would be the best place for work in Ukraine. We are not aiming to change the world. We just want to do our best in our work. Our mission is to build the best place for work in Ukraine and make our clients happy. Could you please talk about your most interesting projects? 80% of projects that we currently have are the projects we found on Upwork. We continue to do this since we are good at it, we have built our system there. It’s very simple — the law of large numbers works on Upwork which means that you regularly have to apply for a big number of projects. Even if we have enough projects today, we are always looking for new ones. Now we have quite a lot of projects, however, teams working on them are rather small. 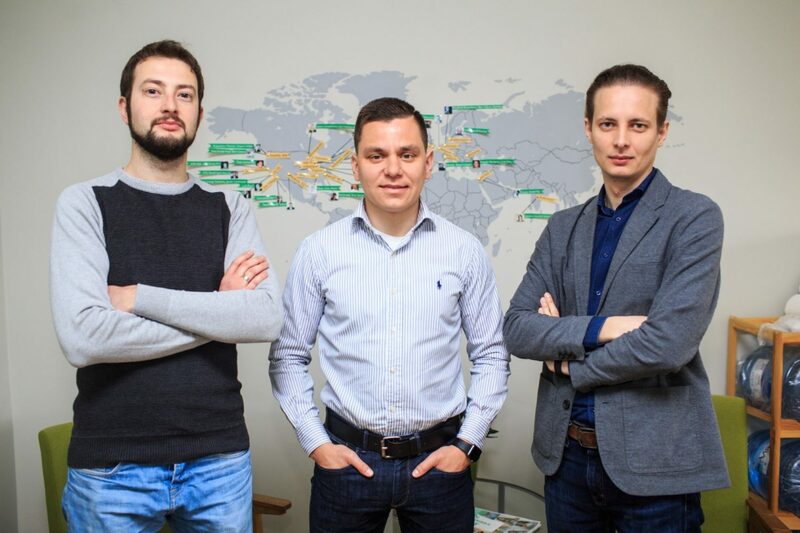 We are proud of the projects that we have started to do with startuppers from scratch and they succeeded. Two years ago we started working on an Australian project — the task was to create a CRM-system for photographers. Currently, there is a team of seven people working there, and the number of their users is growing every month. Last year we started working with a Canadian fintech startup. They also were successful and got acquired by a Fortune 500 company. This is also a success for us. What do you think you need first of all if you want to build an effective company? The answer here is clear — it’s the people. It’s a team of professionals that you can rely on. We have a really strong team now. We chose it ourselves, we basically raised it. I’m a young entrepreneur, so I can’t know everything. These people help me and encourage me to develop. In my opinion, the main thing is an ability to trust people, help them grow. This way they will do everything right and effectively. How would you describe an employee at Sombra? There are many cases when a company can declare certain values or culture, but when you urgently need another developer for a project, they might overlook it and hire the first suitable person. We decided not to do this, even if it was really necessary. If people don’t fit us and it’s difficult to communicate with them at the interview, we won’t hire them. This requires certain sacrifices, it can’t happen otherwise. Because of the desire to select people in accordance with our culture, sometimes it is difficult for us to hire people from other companies. Especially from big companies, because their culture is often already formed — if I get paid more, I will change the company. We don’t like this. We have a different vision. We can’t hire new employees simply by offering them more money. For us, bidding who gives more money is wrong. This has to be done differently. People who came to us from larger companies, mostly haven’t stayed for more than a year. They are usually tempted by bigger money. It’s not a problem, just our experience and you have to deal with it somehow. The only way for us is to teach our employees. Thus, almost 70% of people that we hire are juniors – people without previous experience in working in IT. We help them grow and do our best for them not to be “outbidden” by other companies. How to make it impossible to hunt them in such a way? If a person quits for a more interesting job at another company, thriving for self-development, we will only help this person. We want people to grow professionally. If we can’t provide them with certain conditions, then let another company do it. This is how it works on the job market. However, it’s “unhealthy” when a person works with us for a year and then gets offered a very similar project for the double salary. Our task is to make sure that money is not the decisive factor in changing the company. What is the decisive factor for those developers that are staying? You need to ask this to the employees, but I think that the fact that we involve them in decision-making is the decisive factor. We always try to ask their opinion and cooperate with them. We’ve created a so-called “Council of Elders” — a group of proactive and motivated people who have been working at the company for more than 1, 5 years and are well-aware of our culture. We involve them in the important organizational decision-making. We have regular meetings, twice a year we discuss the strategy of the company’s development. We ask them about problems the organization has from the inside. We want to hear the most honest opinion and understand what needs to be improved and worked on. The main idea is for those people to be able to pass the culture on. When the company was smaller, we were able to keep in touch with everyone, now it’s very difficult. These people have to become sort of our “culture translators”. I don’t see any reason why this approach won’t work. What motivates these employees to stay at the company? Seeing the company grow motivates people the most. People see that the company is developing. If we stayed at the same level with 30-40 employees and instead of growing, would only declare our cool culture, I doubt that people would like to work here. If a company isn’t growing, how can they become better? Only by changing the job. Therefore, in order to keep the best employees, we need to develop. This system reminds a pyramid. Our employees who have started two years ago are now occupying rather high positions. Consequently, about 40% of our employees — are juniors, the rest — intermediate and senior employees. The average age of our employee is less than 25 years. We tried to hire juniors older than 30, but it didn’t work very well. For us, it’s more difficult to work with people who have previous experience in spheres other than IT. The company is now three years old. How do you see it in the next three years? Definitely larger. Our goal — is to grow constantly. I also see the company more mature in organizational processes. In three years we see the company with 300 employees. Would you like to grow faster? I would like to. First of all, to scale our culture. Is is possible? It is. However, do we know how to do it? Only partly, but we are constantly learning. People who come from companies with a different culture and values pass it on to other employees. We cannot afford it. Therefore, we must carefully approach this and check if each individual is “ours” or not. We believe that we’re developing rather quickly. At this point, we don’t want to slow down or accelerate. We are interested in the markets of the USA, Canada, and Australia, so we will work there more actively. We plan business trips and real-life meetings because they are always more useful. All companies want to be developing as actively as possible. Moreover, for most of them, the financial factor is the most decisive one, they don’t focus on all this “cultural specifics”. With new companies emerging on the market, the competition will grow and it might be more difficult for you to work. What do you think about this? I think the opposite — it will be easier for us. We will learn how to keep people motivated not by money, but by something bigger. It’s really important. I’m really happy when employees come and say that they were offered a higher salary, but declined the offer because they are really motivated by what they are doing here. Thus, I’m sure: the bigger the company is, the easier it will be for us. People will know more about us and our organization will be stronger. When there were 20 of us, it was difficult to explain that this approach will work. However, our approaches to building the organization haven’t changed from the times when we were just five. But then, when we talked about it, we were criticized more. People would say that it won’t work, we will lose employees, we need to give them more money because that’s the only way of motivating them. Now, nobody says so, since the organization still exists and is constantly growing. New organizations are not our competitors. It’s hard for smaller companies to attract our employees because they don’t have yet the opportunities we have. Big companies at least have money. We are not afraid of smaller organizations. We are afraid only of large companies like Google or Microsoft, but this is a general threat to the market. Because they would hunt our best developers. What does success mean to you and do you consider yourself a successful person? Yes, I do. For me, success — is a realization of things I want to realize. In my case, to build a big company and make it work and develop without me… These things are still far away. We are at the early stage now. There is still a lot of work ahead. How about your work-life balance? How balanced is your personal and professional life? I don’t have problems with that. I don’t overwork, that’s why I can continue working efficiently. You may burn out in one moment and then it will be harder later. Usually, around 7-8 pm my time for the family starts. On the other hand, I might check e-mails while I’m at home, though I don’t consider this work. Business is not a sprint, but a marathon, isn’t it? It takes a long time to run. Therefore, it’s important not to overwork to always have enough energy for moving forward. Sport helps here. I’m inspired by the fact that we see a concrete result. We don’t have to work for five years to see it. We already see that it works. Well, big goals too. I believe that we can build a unique cultural environment that everyone will know about. I would like to create a special case — when the company’s culture would be the key factor for employees. How difficult do you think is starting a business in Ukraine now? I think it’s not difficult. Business — is definitely an opportunity. If we can learn how to start a business in crisis in Ukraine, we would be able to do it anywhere. In my opinion, doing business, for example, in the USA is not as interesting as here. It’s much simpler there: you register a company, pay taxes and work. We have this in a slightly different way. All these obstacles and challenges motivate me more than disappoint. We need to bypass the obstacles, think how to do the task right. Some people might say that it’s easy for IT companies because they work in Ukraine but earn in dollars. On the one hand, it’s true, but we still experience problems of the Ukrainian business. What are the key challenges? What should young entrepreneurs be ready for? For example, for the fact that not everything is easy in the accounting issues. All of our employees are registered as individual entrepreneurs. Some people say it’s “right”, some that it’s “wrong”. However, these are the realities of our market and there are no other ways now. You just need to accept it and move on. Some say that it’s wrong, and you need to employ people as hired workers. But then, such business won’t be profitable, there won’t be any sense to do it. It won’t be attractive either for companies or the state. Young entrepreneurs need to understand that in practice not everything is as good as in theory. This doesn’t mean that it’s impossible to do something. You just need to do it a little differently. You should also be able to take risks. I will tell you our case of looking for a technical partner. How to look for it? You need to contact experienced developers from big companies and ask if they want to start a business. I started by contacting potential partners in LinkedIn. Out of 30 people, almost everyone was interested. We met with them, they showed interest in starting a company. However, then they would ask how much will they earn. “Will my salary be the same as now?”. I would answer: “No, of course not. It’s a new business, you need to take risks”. Later they would say: “No, then I’m not ready”. That’s a problem. There are not many people who would say that they don’t need business and they are comfortable working as developers. Most people say, they are interested, however, usually, it doesn’t go beyond these words. The most difficult thing is to leave the hired work to start your own thing, to quit. If this step is taken, you will only move up. Of course, there might be some things that would interfere, but now I won’t even remember them. These small things don’t pose a threat to your existence. The threat of existence is a full-scale war in the country. Then you have to think differently about everything: what to do with your business, how to organize your work, where to relocate your office… But again, for companies of our size, this too won’t be something really complicated. 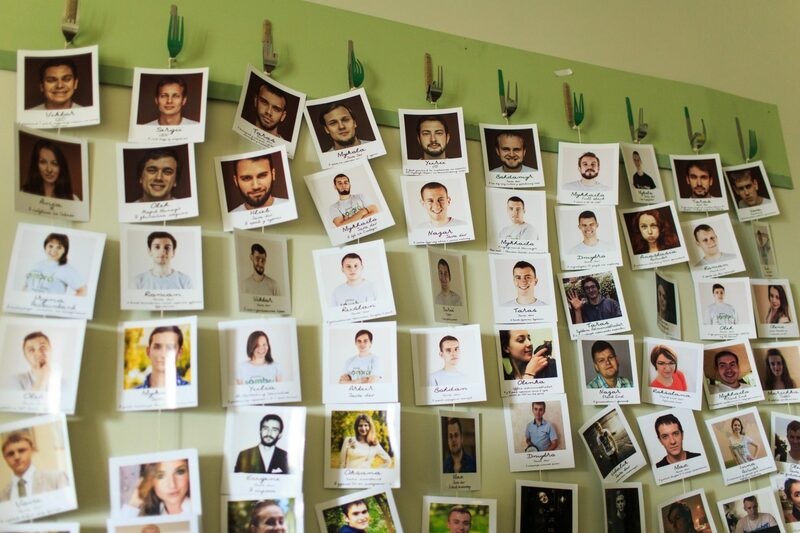 What would you advise young Ukrainian IT entrepreneurs? Don’t be afraid to take risks. I think that the main problem of young people who want to start a business but don’t do it is the fact that they can’t make the first move. It’s difficult to say no to a good salary. Especially in the IT industry. And especially if you have a family or other factors. In my opinion, there is no problem in this. If suddenly something goes wrong, a professional developer can easily find a job even in a week. It is important to make this first step.